On Wednesday, we moved to Pueblo West Campground. Though this campground lacks recreation, except for a children’s playground, it has two advantages compared to the Colorado Springs KOA. The sound of an occasional bark contrasts mightily with the traffic noise of I-25 and the rumbling and horns of railroads blasting, including 50 amps. KOA was $625 a month plus electricity which ran between $82 and $92 additional. Finally, we have a Super Wal-Mart and several restaurants within two miles here. So we are happy campers. I do miss Culvers though. On Tuesday, July 31, we took advantage of a very special offer. Mary Koehler, director of Public Relations for Michael Garman Studios/Museum gave us a behind-the-scene tour of their facility. On Wednesday, as I said, we settled into the new campground. Usually we connect the Jeep to the motorhome, but we didn’t this time, as it was less than forty miles. I led in the Jeep since I had the navigator. We spent the afternoon checking out what the nearby locale offered for restaurants, drugstores, and banks. Then we caught up on laundry. When you have a combo washer/dryer in your motorhome, it is necessary to do laundry weekly. Thursday, we toured the Pueblo Weisbrod Aircraft Museum during the afternoon. Today we are going to the Nature and Raptor Center. Since birds of both types have something in common (they both fly), I hope to do a combination email on those later this weekend when Earl has his photographs prepared. This email is about the Frontier Pathways National Scenic Byway we drove for four hours yesterday. We traveled on County 96 from the plains into the Wet Mountains passing McKenzie Junction and the San Isabel National Forest. The town incorporated February 20, 1879. The first meeting took place in this building in 1880. It is now a museum, open Saturdays and Sundays from 1- 4p.m., which is free to the public. Next door to it is the new city hall which opened in the 1950's. The mine was the Silver Cliff Mine also known as the Geyser. Managed by crooked stock promoters from New York and Boston, it never made a profit. At one time, it was the deepest mine in Colorado. 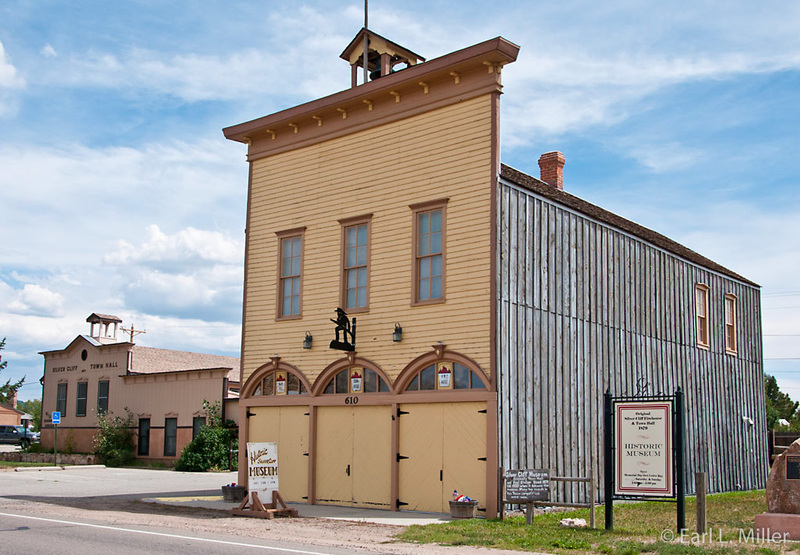 By 1881, Silver City was behind Denver and Leadville as the third largest city in Colorado. Population estimates ranged from 6,000 to 16,000. In June 1880, the official census was 5,040. In Western mining days, Silver Cliff lost the opportunity to be the capitol of Colorado to Denver by only a few votes. Assured it would prevail, the city built a governor’s mansion which stands today. The Denver and Rio Grande Railroad terminus ended a mile west in 1881 - securing Westcliffe’s future as a town. By 1882, the mining boom was over. Mines and mills began to close. Many businessmen and homeowners put their buildings on rollers and moved them to Westcliffe. 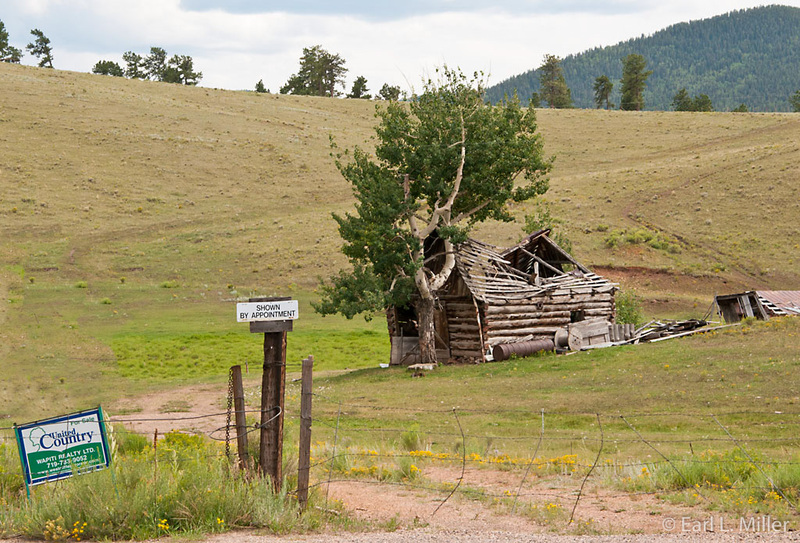 The railroad line abandoned the town in 1888, and by 1900, Westcliffe’s population was 576. Today the depot is the home of the town’s Chamber of Commerce and you can still spot old railroad cabooses. Driving through both towns, I noticed Bed and Breakfasts, restaurants, and several businesses. I was surprised while doing research that Westcliffe had been the secondary of the two towns as in 2012 the opposite seems true. We passed through the Sangre de Cristo Mountains on our return to Pueblo. We took route 165, near Rye, on this highway we made a brief stop at the Bishop Castle. Jim Bishop has been building his castle since 1969. It’s a stone and steel medieval castle open free to visitors. It has circular tower staircases, a chapel with stained glass windows, and a fire breathing dragon. Bishop has broken the record for the world’s largest structure built by a single person. He collected his first rocks from the San Isabel National Forest. The government wanted $16 a ton for the rocks. When he refused, they would not allow him to publicize his creation. Eventually they worked it out. 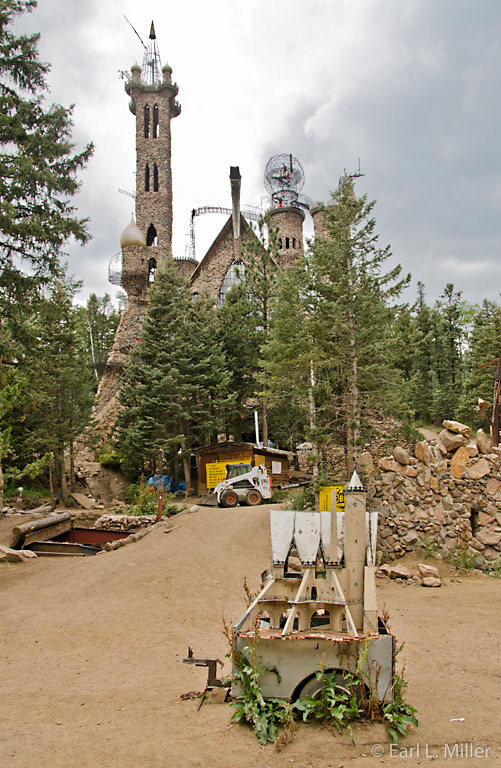 When Bishop finishes, he plans to have three 160-foot towers, a great hall, a torture chamber, elevators powered by the sun, waterfalls, and an astronomical observatory. We refused to climb its narrow winding, steel staircases or attempt his half-finished balconies. But I did notice children and adults, braver than we were, scampering all over the place. We passed on our return old mining cabins and sheds that were disappearing into the earth. We traveled through the outskirts of Rye and Colorado City before reaching Pueblo. Ranches with cows and horses also caught our eye. The natural scenery changed from lots of pines at the start of our trip to primarily Alders after leaving Silver Cliff and Westcliffe. So long for now with more to come this weekend.